This tomato confit and burrata pasta dish came to me in a dream. For real. I’ve been eating as much burrata as humanely possible lately, thanks to some absolutely lovely cheese companies realizing how much I love it so much and sending it to me in abundance. Its raining burrata in my home! So much so that burrata dishes now appear to me in my sleep! Can’t seem to get enough of this creamy goodness burrata in my life. And with cherry tomato season going strong in Northern Cali it seems a match made in…dreams…my dreams to be exact. Tomato confit may sound fancy but don’t be intimidated by the word confit. All confit means is any type of food cooked slowly over a long period of time, so here the oven does all the work while we enjoy these long summer days. The long, slow roasting brings out the sweetness of the tomatoes and garlic and infuses the olive oil with all these flavors which then becomes the pasta sauce. It is sooooo freaking flavorful you can pretty much enjoy it with just a spoon (I do!) and any extra can be soaked up with good bread…yum! 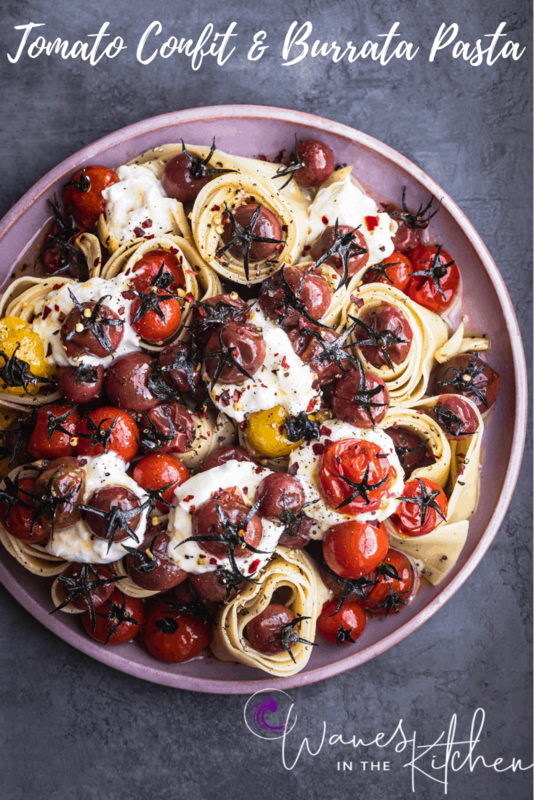 This tomato confit and burrata pasta is what summer is all about. Simple to prepare. Very few ingredients, each bursting with flavor. Because on these long, warm summer days are about playing outside just as much as they are in the kitchen. 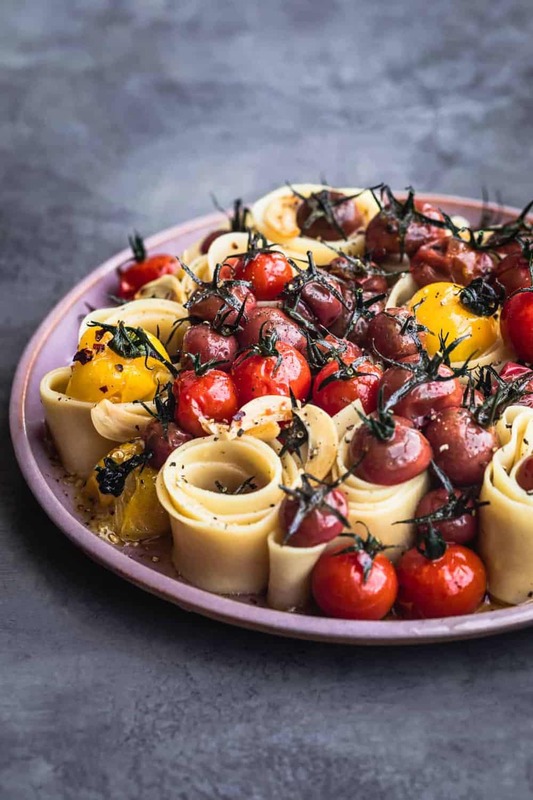 The simple to follow steps below look like this: ya place cherry tomatoes on a baking dish with garlic, herbs, olive oil, cook pasta, mix the baked cherry tomatoes confit and their oil with said cooked pasta, burrata goes on top and voila…easy peasy…I know ya got this! ***Please note: I wrote this post in the June but didn’t launch my blog until September which is why I’m talking about enjoying summer in the fall. Preheat oven to 300 degrees. Place the tomatoes in a single layer in a baking dish. Add the garlic slices and basil sprigs. Pour the oil over the tomatoes and season generously with salt and pepper. Add a touch of chili flakes to taste. Bake for 1 hr. While the tomatoes are in the oven fill a large pot with salted water and cook the pasta, according to the package instructions, until al dente, drain and put in a serving bowl. Remove the tomatoes from the oven, discard the basil sprigs and pour the olive oil from the tomatoes on top of the pasta and toss gently. Place the cherry tomatoes and garlic on top of the pasta and toss lightly, preferably with your hands. Break chunks of burrata off and place on top of the pasta. Season, to taste, with more salt, pepper, and chili flakes. Absolute pleasure and thanks for your comment! Am absolutely positively dying to try ricotta like that now…yum!!! Thanks for sharing :). Love, love, love this pasta ?? ?